Which Health Care Career Is Best For You? Healthcare is a vast and expanding industry. With so many career paths, it can often become confusing trying to figure out which one to take. Do you want hands-on experience or are you better on the administrative side? Should you become a Patient Care Technician? Medical Assistant Tech? Or Medical Billing & Coding Specialist? Or have you considered a career as an Ultrasound Technician? This blog post discusses the qualities that these medical professions must possess. Before you begin your health care training, find out which profession best suits you! PCT’s often have more direct contact with patients than any other member of the healthcare team. Patient care technicians provide valuable support to both the patients and the medical staff of hospitals and medical facilities. If you thrive in fast-paced environments, enjoy working with people and are interested in helping others, training as a Patient Care Technician could be a good health care career for you. Because PCTs work with patients on a daily basis, they must have solid communication skills and be empathetic and attentive to patient needs. Patient Care Techs must possess satisfactory intellectual and emotional functioning to ensure patient safety and to exercise judgment and discretion in performing clinical tasks. PCT’s must have enough physical strength and endurance to be on their feet for extended periods of time, and to move immobile patients. In a health care environment, the information a medical assistant collects and has access to is privileged information. Integrity is critical to being a good medical personnel. As a Patient Care Technician (PCT), you will have daily hands-on experiences with patients by helping them with procedures such as taking vital signs, performing EKGs, drawing blood and other needs. Patient care technicians work with doctors, nurses, and other health care professionals in a variety of health care facilities. According to the U.S. Bureau of Labor Statistics, they most often work in long-term care, such as nursing homes, rehabilitation clinics, and assisted living places. If PCT is a good fit for you, start your health care training today! You may be wondering if you have the right skillset to succeed in the field of medical billing or coding. Many Medical Billing & Coding Specialists have analytical personalities and strong organizational skills. Attention to detail is extremely important in the medical billing and coding profession. Many of the responsibilities of either a coder or a biller rely on the ability to pay attention to minute details. Because you are working with numbers and money, a strong analytical ability is helpful. The types of analytical skills include making sure that everything is where it needs to be on a claim, and checking that the diagnosis and procedure codes match up. Other important analytical skills include the ability to analyze medical records to assign the correct diagnosis and procedure codes on a claim, and making sure the claim was billed correctly. In this business, you are dealing closely with people’s money and sensitive information, so Medical Billing & Coding specialists must demonstrate professional behavior at all times. Because medical billing and coding is so complex, it pays to be well-organized. Depending on your office, you may be billing or coding for hundreds of patients. You must be able to keep track of all the claims and make sure they all get paid within the proper time frame. Many medical professionals have notoriously bad handwriting, and the ability to successfully read and interpret this is always helpful! You may be required to collect payments from insurers or patients. Therefore, you must be assertive and persistent when necessary. It takes education and health care training to become a skilled medical coder. To begin, you must have a thorough knowledge of anatomy and medical terminology. It is also important to become familiar with different types of insurance plans, regulations, compliance, and the coding, including CPT, HCPCS Level II and ICD-9-CM codes and guidelines. If you’re interested in a medical billing & coding career, start your health care training today! MA responsibilities typically include administering injections, drawing blood, ordering supplies & equipment, preparing exam rooms, scheduling appointments for patients, taking vital signs, recording patient medical history, and more. Listening to others while still asking relevant questions is key to obtaining valuable information that may be helpful to the doctor. Good communication is also about sharing important instructions provided by the physician clearly with patients and answering any questions they have. It’s not only important to be a good listener, but also to understand concerns and other situations patients are sharing with you. This may help them feel more at ease during the appointment. In a health care environment, the information a medical assistant collects and has access to is privileged information. Integrity is critical to being a good medical assistant. A busy doctor’s office or clinic can get quite hectic. There will always be plenty of paperwork to maintain and patients come to the facility in need of care. The everyday stresses of a busy environment require a strong, tolerant person to effectively handle them. By being alert and attentive to details, you will be better able to help your patients, assist the doctors caring for them, and aid your colleagues so they can do their jobs more effectively. Agility & Strength: Manual dexterity, good vision, and physical strength is helpful for medical assistants when performing medical procedures. If you possess those qualities, then Medical Assistant Tech may be a good career choice for you! Ultrasound technicians perform scans on patients using ultrasound equipment. These scans are diagnosed and interpreted by physicians. Attention to detail is critical. You are the eyes and the ears of the radiologist, the doctor who reads the studies you do. You have to be 100% accurate and know what you’re looking at. Doctors rely on you to give them the most accurate information, and often distinguish between cysts and fluid, and cancer and lymph nodes. You must also be able to follow directions, and provide doctors with the specific scans they’re requesting. It’s important to be skilled with technology as well—the school you attend may have modern machines, but in order to be a versatile scanner, you’ll need to practice on older ones as well. Learning how to adjust or fix different types of machines to give you better picture quality is also critical. Your attitude, your energy, and your willingness to learn will take you far. When you go on externship, you will meet people with many more years of experience than you, and they will offer ways of getting information easier, scanning better, and give you ideas on how to improve. Be open-minded and listen to their advice. The more you know, the better you become! 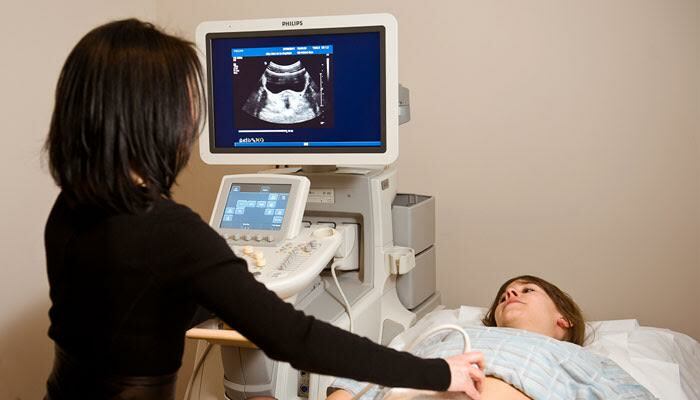 The type of school you choose to attend is extremely important for ultrasound training. Make sure that they will spend enough time with you and provide enough hands-on practice and training before you go on externship. Do not leave the school until you feel well prepared. Your school should assist you every step of the way and build your confidence before you begin your career. So where do you belong? Get started on the path toward your dream job now.